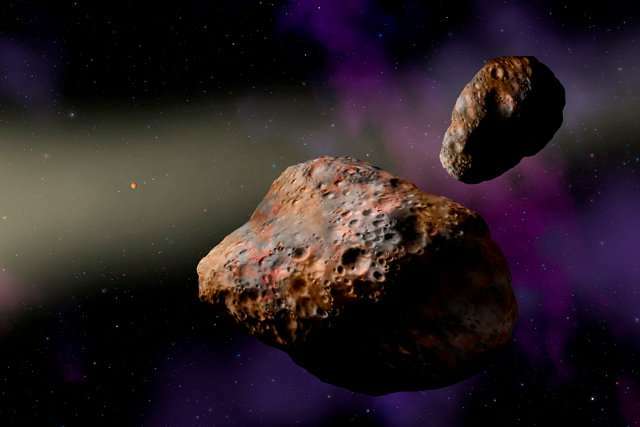 Scientists at Southwest Research Institute studied an unusual pair of asteroids and discovered that their existence points to an early planetary rearrangement in our solar system. These bodies, called Patroclus and Menoetius, are targets of NASA's upcoming Lucy mission. They are around 70 miles wide and orbit around each other as they collectively circle the Sun. They are the only large binary known in the population of ancient bodies referred to as the Trojan asteroids. The two swarms of Trojans orbit at roughly the same distance from the Sun as Jupiter, one swarm orbiting ahead of, and the other trailing, the gas giant. "The Trojans were likely captured during a dramatic period of dynamic instability when a skirmish between the solar system's giant planets—Jupiter, Saturn, Uranus and Neptune—occurred," said SwRI Institute Scientist Dr. David Nesvorny. He is the lead author of the paper, "Evidence for Very Early Migration of the Solar System Planets from the Patroclus-Menoetius Binary Jupiter Trojan," published in Nature Astronomy. This shake-up pushed Uranus and Neptune outwards, where they encountered a large primordial population of small bodies thought to be the source of today's Kuiper Belt objects, which orbit at the edge of the solar system. "Many small bodies of this primordial Kuiper Belt were scattered inwards, and a few of those became trapped as Trojan asteroids." A key issue with this solar system evolution model, however, has been when it took place. In this paper, scientists demonstrate that the very existence of the Patroclus-Menoetius pair indicates that the dynamic instability among the giant planets must have occurred within the first 100 million years of the solar system formation. Recent models of small body formation suggest that these types of binaries are leftovers of the very earliest times of our solar system, when pairs of small bodies could form directly from a collapsing cloud of "pebbles." "Observations of today's Kuiper Belt show that binaries like these were quite common in ancient times," said Dr. William Bottke, director of SwRI's Space Studies Department, who coauthored the paper. "Only a few of them now exist within the orbit of Neptune. The question is how to interpret the survivors." Had the instability been delayed many hundreds of millions of years, as suggested by some solar system evolution models, collisions within the primordial small-body disk would have disrupted these relatively fragile binaries, leaving none to be captured in the Trojan population. Earlier dynamical instabilities would have left more binaries intact, increasing the likelihood that at least one would have been captured in the Trojan population. The team created new models that show that the existence of the Patroclus-Menoetius binary strongly indicates an earlier instability. This early dynamical instability model has important consequences for the terrestrial planets, particularly regarding the origin of large impact craters on the Moon, Mercury and Mars that formed approximately 4 billion years ago. The impactors that made these craters are less likely to have been flung in from the outer regions of the Solar System. This could imply they were made by small-body leftovers of the terrestrial planet formation process. This work underscores the importance of the Trojan asteroids in illuminating the history of our solar system. Much more will be learned about Patroclus-Menoetius binary when NASA's Lucy mission, led by SwRI scientist and paper coauthor Dr. Hal Levison, surveys the pair in 2033, culminating a 12-year mission to tour both Trojan swarms. The observation on dynamical lifetimes only move the time of the old and accepted Nice theory planet migration. It is also less sensitive for statistical problems than the estimates for lunar crater ages. It tickles me that asteroid dynamics and crater timing specialist Bottke is on the paper and admits elsewhere that if the estimates of delayed cratering is correct it must be uncoupled from the planet migration. Or more simply the dating is mistaken as other data and the known problems with the dating statistics suggest. The < 100 Myrs early planet migration is a perfect match to the ~ 60 Myrs Moon forming impact date and the recent phylogenetic estimate of life emerging within < 40 Myrs from that!